The rainy season has officially begun. According to the Meteorological Agency, it begun on June 5 in the Kanto region; three days earlier than average and two days later than it did last year. So. June is the month of rain. 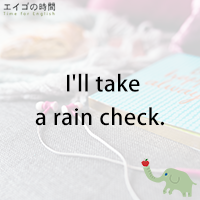 And I’m going to give you a rain-related idiom today. Are you familiar with the expression “to take a rain check“? Actually, the phrase itself has nothing to do with rain. It’s more about declining an invitation. For example, your friend says, “Would you like to join me for dinner tonight?” Unfortunately you have other plans. Here you can say, “Umm… maybe not tonight. Can I take a rain check on that?” You can also say “I’ll take a rain check on that.” It means you can’t accept the offer right there and then, but want to do so some other time. Anyhow, it’s an elegant way of saying no to an invitation. It’s very useful. So let’s practice together.